A smoke and mirrors game is being played in the public arena's while debating the efficacy of social justices like gay rights, equal pay for woman, economic imperialism and the dominion over ones body. I would go so far as to say that most politicians represent their particular constituents and elector base by agreeing that racial equality as expressed in the civil rights movement was and is a non negotiable steadfast given. Why are we still debating the minutiae of civil unions, LGBT marriages and the Judeo Christian marriages? That's a topic for another time. Shifting gears to an economic hegemony imposed by the US on Mexico. What is at the crux of the fear-mongering which is fueling an inhumane and malicious idea about building electric fences around our boarder with Mexico. Presumably it's to keep the undesirables out yet I see it missing the mark on a few fundamental points. The most glaring point is the notion that these economic and political refugees are sneaking through our porous national boarder to parasitically dine on America's bevy of good fortune. The fact that America has been transforming herself into a 2nd world country with it's chasmic separation of the have's and have not's would seem like a fools errand to those el sud emigre’s. The wealth in the US is not being distributed equally as bared out in the appalling employment and job indices. I am ignoring but not forgetting the rapid decay of the buying power to the inflationary index. The price of widgets is going through roof compared to the money most Americans are taking in each month. Let's pause and remember that our militant nostalgia for an agrarian economy is in reality run by gigantic Agra-business. Nonetheless, this nostalgia is firmly rooted in the realm of “invented tradition”, which was espoused by the Marxist Historian Eric J. Hobsbawm, and won't be dissipating anytime soon. These mammoth corporations, like all corporations, are intrinsically psychopathic at their core. They have a singular myopic drive to maximize profits which logically entails minimizing costs. One of the biggest costs to Agra-business is labor. As the statistical trend continues less Americans are willing to engage in these horrendous working conditions for meager pay, marginal job security and negligible health benefits. These emigre's from Mexico primarily have filled those employment gabs which Americans are reluctant to do. Perhaps if we didn't have the political talking point embodied in a tidal wave of economic refugees then Americans might be lulled back into those jobs which would ipso facto be vacated by the Mexicans. Sure; I think that might be an jolly mental masturbation exercise which may even bear fruit; albeit bitter fruit. The logical overarching question to ask then becomes; why would the Mexicans want to stay in Mexico?” More to the point; “how can we keep them there?” I don't mean to be derisive or flippant nor denigrating. Simply how can America foster a love affair between Mexico and Mexicans? Since NAFTA, and almost certainly before, large influental American businesses have kept the bulwark of RD in America while shifting manufacturing to Mexico. The reasoning is a 1-2-3 police line up of all the usual suspects: favorable tax breaks for investment, tax reduction being paid in America and cheap cheap cheap labor. If Mexico could garner some long term economic boon coupled with modern manufacturing for herself, publicly and privately owned and run, wouldn't that be at least a motivating factor to stay put and reap some of the economic bounty? America has to rethink and retool it's economic/political/social ideologies and policies. The quick fix to a symptom doesn't heal the disease. Another slight of hand parlor trick that has preoccupied the public forums is intelligent design. Intelligent design has been built on a bedrock of an eroding dogma called creationism. The ridiculous discussion about embryonic personhood rights versus the seizure of a woman's body and her unequivocal right to govern her person, is at the core of this civil liberties debate. The pro-life versus pro-choice camps have pitted themselves against one another in a World War 1entrenched ideology battle. The spearhead of this demagoguery has been encased by the debated right to terminate a pregnancy. The fact that abortions are carried out clandestinely by natural selection on women all the time is an often overlooked fact on both sides of the argument. We tend to cloak the meaning of abortions by deeming it spontaneous miscarriage. A bit of semantic tomfoolery. “What's in a name”, Shakespeare once sardonically riddled. Normally I would agree with that kind of assessment for most concepts. The English language, due to its 50/50 ratio of French based Latin derived lexicon on the one side and its Germanic roots on the other, provides a rich and varied yet confusing choice of nuanced verbiage. Sometimes the choice of a word is like playing a dictionary roulette wheel. Although there are different numbers ultimately we pick either a red or black. The word is either tangential or it isn't. However, in this case I think that the word choice does matter. Abortion laden like a cargo container with emotional and ideological baggage. If we change the verbiage from abortion to miscarriage then we defuse the weight of the ethical and moral argument by superimposing a neutral scientific term to mean the same thing. Why would an intelligent designer purposefully deliver a philosophical paradox? Did a benevolent and omnipotent creator fashion an intentional flaw in the logic of preserving life? When we examine these questions an unresolved and unnoticed conundrum among the most fervent supporters of anti-abortion legislation appears. The same supporters are routinely the same lot who adamantly embrace legalized executions and have zero tolerance for stricter firearms regulations. Pitchforks and torches are metaphorically raised seeking retribution even when it doesn't effect them personally. As I think about the smoke and mirrors and the window dressing and the con games which we all seem to be hoodwinked by I am reminded of the Wizard of Oz. 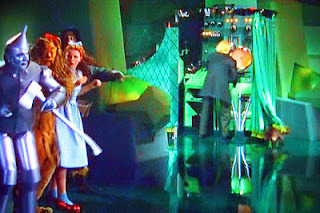 When Dorothy, the Tin Man, the Scarecrow and the Lion enter the Wizards lair with the witches broom to prove they vanquished the witch they notice that the dog Toto is tugging at a curtain. They watch Toto tug away at the curtain as a booming voice and ominous video tell them to ignore the man behind the curtain. Thankfully for the denouement of the story they emphatically questioned the authenticity of the booming voice behind the curtain. America needs to start questioning the Wizards of politics and the media.